Should I Give Up Or Not? Home > True Inspirational Stories > Should I Give Up Or Not? The correct answer is NO. With some exceptions. Never give up, folks. Never. If what you want to do is beneficent, has a positive basic intention and doesn’t endanger your soul (by allowing it to become arrogant for example), fight. Fight! And FIGHT!! Absurd great things may happen. See the way I didn’t miss my train in 1990. I wanted to apply for a grant for making a Museum for Feelings. I have coined this name for the ancient Dacian Village I want to build in a present-day Romanian village not far away from our city. In this Dacian Village to be built coming people would be able to live, work and feel as our ancestors the Dacians have, 2000 years ago. The cultural grant was right the amount I would have needed to make all the wonderful and vivid details I had in my mind, including all the related info-sphere (like programs and books and activities). I even had found in an incredible short time a wonderful piece of land for that. Illustration of Should I Give Up? Lost this wonderful parcel of land? Wonderful indeed. It is on a top of a hill, and is surrounded by a natural fence made of bushes. All the (still barren) trees to be seen (it´s early spring) bear in summer fruits. The tree in the front shows there is water beneath. Almost perfect. 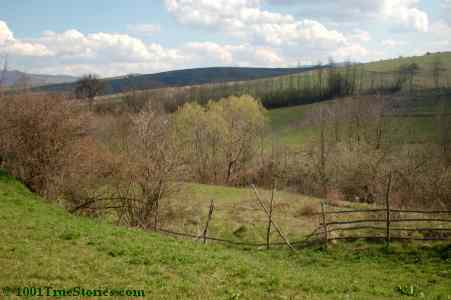 I say „incredible”, because on the countryside in Romania landowners’ papers for the lots are only halfway OK. It’s a tedious and expensive endeavor to get the papers fully OK, as the grant requires it. The more landowners, the more complicated, of course. And I needed more than a hectare (10.000 sq. meters) for my Dacian Village, but there are very, very few lots of land in one piece. Considering also my other requirements besides size, like water and scenery and so on... Mission almost impossible. The deadline for applying for the grant was on April 7th 2014. ...Well, ground found, ground lost. Almost in the eve of making the papers for getting it. The owners have changed their mind on 29th of March. I was smashed down to the Earth. Not only that day, but also those to follow. On Wednesday morning, April 2nd, I was in the church. It was lent time. 10% of Romanians do observe the traditional fasting time and even more go to confess in this time. Us included. Here I was, sad, troubled, disappointed – I barely could look around, waiting for the priest who had shortly left the room after the previous person. Mr. Iancu, a man working in the church we are acquainted with entered the room to take something – and saw me. "What’s the trouble?” he empathetically asked me. I was about to burst into tears. I felt I couldn’t prevent me from that, so I shut up, just nodding. I was aghast. Yes, he had told us in January about them selling their countryside house, but our purpose by then was private and its location, the place where the village was, was definitely not what we needed. But we hadn’t talked about that all those months since. About my plans neither. How did he get now the idea that it was a piece of land and not something else what I was about to burst into tears?!? And also, that now the premises changed? That very afternoon I was up and away toward that village. 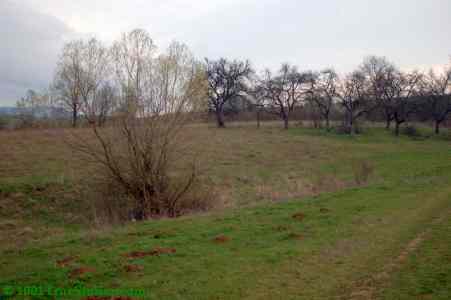 It was wonderful indeed, peaceful and great surroundings for a Dacian Village. However, the piece of land around the house was „wrapping” it in an unpractical way. But those few hours after our discussion and before actually seeing it, I had lived a revival. Mr. Iancu’s news made me eager to take this new chance, and took me out of my "mourning”. Even if it was not what I was looking for, somehow I didn’t care anymore that I was missing the deadline for the perfect grant. It was April 2nd and the deadline was on 7th. I thought, I’ll find another cultural grant for sure. And then, on Saturday, April 5th, somebody told me that there is another grant indeed. A smaller version of the barely missed one, having its deadline on April 25th. And I found the strength to start all over again. It was crazy, I had no piece of land to build on and many papers needed in the process were based on having it. But after having once lived my missed train story, and another one I’ll write some time, nothing seemed absurd enough to stop me. It’s enough to tell you that on next Wednesday, on 9th, I have already found the perfect place for the Dacian Village. It even has a natural water spring on it. And the surroundings... Whoaaaa! On a plateau with extension possibilities, too. Illustration for Should I Give Up? Thanks God I have lost the first piece of land. This way (and by pursuing the search!) I found the one below, amid an even more beautiful scenery, and with a water spring on it! ... I might write once a book about „Making of” this future Dacian Village. The three weeks between this above and actually sending the documentation for applying for that grant was like living in a roller-coaster. Nothing was nailed down, and a continuous suspense. An incredible array of problems and an even more incredible arrays of solutions. ... my answer will be NO! Just be patient. God has something better in his sleeves for you. Just be patient AND trust Him! !